The 8th additional army for Neuroshima Hex! 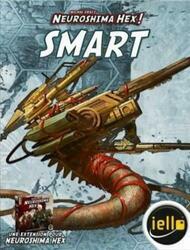 Smart is originally a component of Moloch. As the clashes against humans progressed, this army was drawn to the south of the continent where it eventually lost contact with Moloch. She then found refuge in the heart of the Neojungle. As the days passed, the link between Smart and Moloch became more and more tenuous, to disappear. Ignoring the directives dictated by Moloch's electronic brains, it began to produce strange machines to which living organisms were grafted, such as bio-droids capable of regenerating themselves or parasitic micro robots equipped with technologically advanced electromagnetic weapons. Most Smart bases are deeply buried. What is going on there remains a mystery, for humans as well as for Moloch. Smart's main asset is the extreme mobility of its units placed around its HQ, the possibility of creating formidable fire lines (thanks to Gauss's Canons) and the special ability of its Carriers to place the right unit in the right place. The HQ's poor mobility is its weakness. Be careful this game is an extension of Neuroshima Hex ! 3.0 ... + 2 more+ 2 more and cannot be played alone. To be able to play it you must have a copy of the game Neuroshima Hex ! 3.0 ... + 2 more+ 2 more. 2008 - Neuroshima Hex !